Set in Nigeria’s Delta amidst the swamps and mangroves lit up by the orange flares from the oil exploration which has devastated the countryside, killed birds, fish and other wildlife, polluted the water courses and change for the worse the lives of many. This is the story of Rufus, a young Nigerian journalist, and his quest for the “great story” as he is goes to meet the kidnappers of the wife of an European oil executive on whose behalf he has been hired to establish that she is alive. Rufus finds his search is as murky as the maze of waterways and islands that make up the Delta . 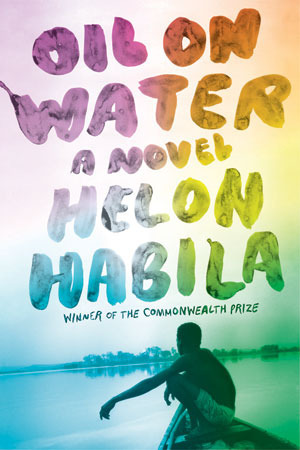 Habila weaves the tragedies of lost lives, lost loves and the lost way of life into the oppressive tropical heat and stifling oil saturated fumes of the fight between military and militants, oil corporations and local people. Inevitably there will be readers who compare this to Conrad’s Heart of Darkness, especially in the parts where we see power corrupting, the distortion of human relationships and the madness of those struggling against the tide. It is all there but the pace of his writing keeps it from overwhelming the reader whilst remaining at the heart of this novel.